Today’s high: 85 degrees – Welcome to Wyandotte Daily! Today’s high will be in the mid-80s, according to the National Weather Service, with mostly sunny skies. 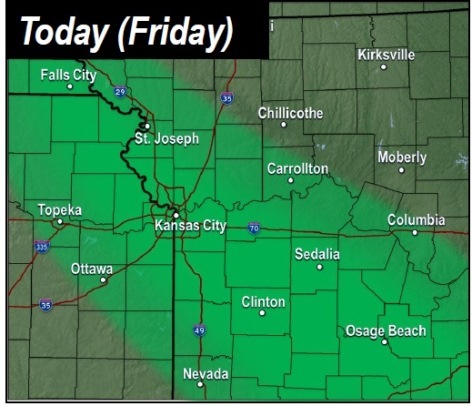 While there are some isolated showers possible in the region today, the Wyandotte County forecast doesn’t call for rain until after 1 a.m. tonight. 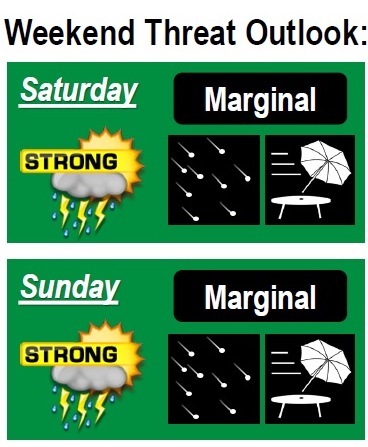 The chance for isolated, scattered showers will continue Saturday into Sunday, and then Monday and Tuesday, according to the forecast. Today, the forecast is a high near 85 with a north wind of 3 to 6 mph, the weather service said. Tonight, there is a 20 percent chance of showers after 1 a.m., with a low of 66, according to the weather service. A light and variable wind will become east around 6 mph after midnight. Saturday, there is a 40 percent chance of showers and thunderstorms, with a high near 81, the weather service said, and a southeast wind of 6 to 8 mph. Saturday night, there is a 40 percent chance of rain with a low of 65, according to the weather service, and an east southeast wind of 3 to 7 mph. Between a tenth and quarter-inch of rain is possible. 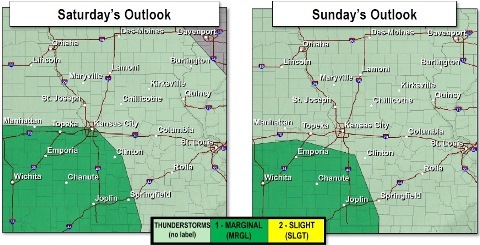 Sunday, there is a 40 percent chance of showers and thunderstorms, with a high near 81, the weather service said, and an east northeast wind of 5 to 7 mph. Between a tenth and a quarter-inch of rain is possible. Sunday night, there is a 40 percent chance of showers and thunderstorms, with a low of 64, according to the weather service. Monday, there is a 50 percent chance of showers and thunderstorms, with a high near 79, the weather service said. Monday night, there is a 30 percent chance of showers and thunderstorms before 1 a.m., with a low of 63, according to the weather service. Tuesday, there is a 30 percent chance of showers and thunderstorms after 1 p.m., with a high near 82, the weather service said. Tuesday night, it will be mostly clear with a low of 62, according to the weather service. Wednesday, it will be sunny with a high near 87, the weather service said. Wednesday night, it will be mostly clear with a low of 66, according to the weather service. Thursday, it will be mostly sunny with a high near 88, the weather service said.